We are comparing the accuracy of measuring E.Coli parameters using an in-situ water testing kit against ex-situ measurements performed in government laboratories. Bali has faced serious problems of deteriorating water quality over the past year. The most common water contaminants found in water sources in Bali is E.Coli caused by improper dumping of garbage and sewage in open water channels. For drinking purposes, water purifying technologies are advertised as being able to remove bacteria and pathogens through their filtration system, however it is difficult to be sure of the quality of the filtered water every time as the water source is always different. E.Coli bacteria is considered the most concerning contaminant found in drinking water. Current E.Coli assessments rely on the government and involve a conventional laboratory analysis (ex-situ measurement), a complex and time-consuming process which often depends on the availability of government staff to collect the samples. While the test is affordable at US$3.80 per sample test, it is more the time concern and the fact that the test can't be performed in the field. Transporting the samples could also potentially lead to contamination so the results are inaccurate. By enabling on-site E.Coli testing, the government and other organizations can monitor E.Coli in an easy and affordable way. These simple tests could also be conducted to map the water quality across Indonesia in relation to E.Coli. 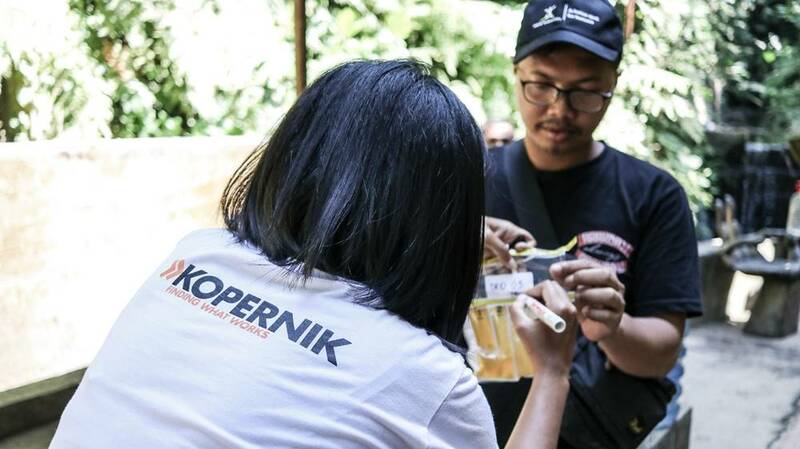 Additionally, the results of this test could help people in Bali who currently lack the means to test the quality of their drinking water and ensure it is free from E.Coli contamination. The result from this experiment showed that Akvo Caddisfly kit performs reasonably well in measuring the E. coli levels in drinking water. 80 percent of the time both Akvo’s and Laboratory readings fell under the same WHO’s risk profile and based on absence-presence cases, both readings were in agreement 83 percent of the time. We also found that the Akvo Caddisfly E. coli test kit gave results four times faster than the laboratory and further reduced the time required to perform a series of E. coli tests by 67 percent. In term of cost, the laboratory analysis is cheaper as compared to Akvo at least until 800 tests are conducted, provided that the laboratory is located within 25km. The app and data collection platform were appropriate for large datasets and comprehensive water quality studies.